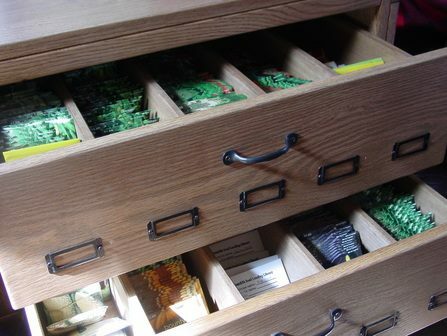 Choose up to 5 packets of seeds to checkout, take home and plant. You will receive instructions specific to your seeds on how to plant and save seeds. Check out related programs at participating libraries. Plant your seeds and enjoy the fruits of your labor! In the seed catalog, the seeds are alphabetized first by common name and then by variety. For example, under the broad category of Tomato, all the tomato varieties are alphabetized by variety ('Amish Paste' comes before 'Brandywine', which is followed by 'Chico'). The dividers for each type of plant (bean, lettuce, tomato) contain information about seed saving, including that plant's seed-saving “difficulty level.” A green label indicates it is “easy” seed to save. A yellow label indicates “medium” difficulty, and a red label indicates it is appropriate for “advanced” seed savers. It is wise to begin with “easy” seeds to make sure you will be able to bring some back at the end of the season! Be sure to start with seeds that are labeled “easy” and learn the basics of seed saving. We ask that beginning seed savers grow out and return seeds from lettuce, tomato, bean, or pea plants the first year. “Medium” and “advanced” seeds require special planning to preserve the purity of the variety. If you return seeds to the library without taking certain precautions, they will not produce plants that are true to type. Read up on the subject. Begin with our literature “How to Save Seed.” The books Seed to Seed by Suzanne Ashworth andBreed Your Own Vegetable Varieties by Carol Deppe are highly recommended. Our library has these and several other books on seed saving available for checkout.